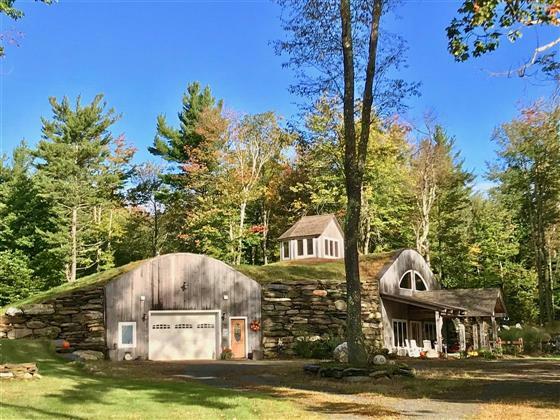 Experience serene and private underground living on an 83 acre setting with 3 State Views adjoining pristine preserved farm land. This quality built earth home incorporates local materials and unique details that you must see to appreciate. The energy efficient safe haven is fully insulated and includes outside wood boiler, solar panels, gas boiler, radiant heat, attached 2 car garage, 26 x 40 heated barn and an amazing front porch! It has a welcoming interior with gorgeous cook’s kitchen that opens to the sunlit dining and living area with high ceilings and gas fireplace. The spacious first floor master suite has a beautiful full bath with tiled walk-in shower. The second floor has another bedroom, half bath and sitting area with exterior access. A bonus on the third level is a sunroom where you can sit back and enjoy the surrounding views & wildlife. Perfect for outdoor enthusiast only 5 miles to Berkshire East Resort. 15 min Shelburne Falls, 30 mi Greenfield & the Berkshires.